Floor Size : 9' x 14'3"
Sleeping Area: 81.25 sq. ft.
Vestibule Area: 49.4 sq. ft. Pack Size: 9" x 28"
Minimum Weight: 26 lbs. 12 oz. If you want to have just the right tent to make sure that your family is able to have a most enjoyable camp out, then you need to give some serious consideration to possibly purchasing and using the tents made by Eureka. Their Suite V6 Family Camping Tent has been designed to be the perfect addition to your camping endeavors, giving to you the quality of service that you need whenever you decide to take your loved ones on a trip. Does this tent come with floor and vent? Yes, this tent has both floor and vents. Floor Size : 9' x 14'3" Vents: mesh ceiling and two mesh side panels. Overall this tent has served us very well when camping on the beach or grassy areas. If you were to take it camping in the woods the bottom of the tent might need some protection from sharp sticks or rocks. Is has stood up to everything nature has thrown at it so far (heavy winds and driving rain) and stayed structurally sound the whole time. We like tents like this because of how well ventilated they stay when it is hot outside. It is fairly simple to clean and tie down properly, and we don't anticipate any problems with it. Our family (including children and two dogs) chose this tent for its room and durability, and we are glad we did. All the space that the multiple rooms give us lets us all fit in comfortably with room to spare for our gear (there were also pockets on the walls to keep the gear off the ground). The room separators are removable and the two doors are nice and big. Although some people dislike the material the bottom is made of, I believe that it keeps water out better than plastic tent floors (kept us completely dry in moderate rain). It is nice that the rain fly can be removed so easily when you don't need it. The only real problem we had was with the directions. They are extremely confusing for those not used to setting up a tent, and they really need better illustrations. Even so, we put the tent up in less than half an hour at home and less than twenty minutes at the campgrounds. If you are looking for some extra room inside your tent then I would definitely get this one. With three people going camping there was plenty of room for us to not only sleep in the tent comfortably, but also have extra space to do things like eating inside the tent if insects are a bother. There was enough space for our gear and us (and our baby) with plenty of room to spare for chairs. The wide window was also great for when we wanted to enjoy ourselves inside while still admiring the view. We had a couple of issues, but one might have been unique to us. First we would have to caution against getting this tent if you are trying to go hiking with it as it is a little heavy when packed up. Second, some of the support poles' cords snapped the first time we used them, so trying to figure out which pole goes where was a chore. Tent has worked great other than that. If you are planning to use chairs or tables in the tent, don't use this model. The bottom of the tent is constructed using the same thin nylon as the rest of it, so it probably wouldn't hold up to point pressure very well. It also seems like the bottom of the tent might leak since they attach the different panels at the bottom edge. I have only gotten tents used with woods camping before, so the construction differences were a surprise. Even though I was considering sending the tent back, my family seems to like it so I am reconsidering. 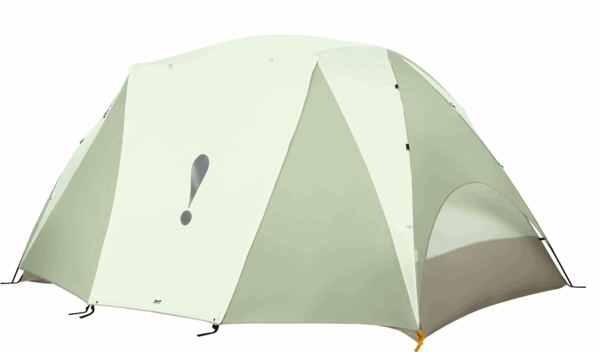 Just make sure you know how you are going to use the tent before you purchase this model. So far I have not used the tent while it has rained, so I can't vouch for its waterproofing, but I can tell you that the ventilation on this tent is great. The design of the tent keeps it bright inside and it is good looking from the outside. It was simple to put up and feels strong even though it is light. I would buy it again. After our first use of this tent, I have to say that I love it! We finally had to retire our Tetragon 4 (after more than 14 years, the fly eventually wore out) and decided to get the Suite V6. My husband is over six feet tall and so we decided to go for a tent with extra room. This tent not only gave us plenty of extra floor space, but was plenty big for my husband. The small area in the front of the tent allowed us to stash all of our gear and extra bags in a nice, out of the way place. Overall, my husband and I are very pleased with our purchase. The tent is fairly simple to put up and break down. I like the fact that it is so easy to get in and out of it. One word of caution, some cots or beds won't fit very well in the tent since the floor layout is a little unusual. This tent feels very rugged and we plan to get plenty of use out of it. For large families this tent works out great, and ventilates well. I have a couple of recommendations. First, make sure you set the tent up at least once before you actually go out. The directions need improvement, but it is possible to figure them out without too much fuss. The second time around it will go much faster. Also, it would be nice to have a couple extra poles to hold the overhanging part of the rain fly. Make sure that you set up the tent at least once before you take it out the first time. We had a little bit of a moisture problem, but nothing serious. I definitely believe that we got a great value with this tent and would buy it again. Don't get me wrong, I like this tent, but you would think that an international company like Eureka could find someone with 5th grade English skills to write their Instructions. They are worse than bad. Totally Useless!!! That aside it is a very nice - roomy tent. Do yourself a favor and set it up in the back yard before you go camping - get several smart friends to come over and buy them the best beer to help you. We just returned from our first camping trip using our new Eureka V6 tent. It is an odd shape-like the designer put it together with tangram blocks. The corners are not at right angles so regular shaped items like an air mattress do not fit right. This being said, I liked the tent and it worked fine for us. There were 4 adults, two of which were over 6 ft. tall. We could all stand upright, plenty of room for two twin and one queen mattress. Because of the tall, lean profile, I was concerned about stability in wind. It weathered moderate windy conditions with a minimum of flapping and swaying. It didn't rain so I don't know how it shapes out in wet conditions. So far, so good. It sets up fairly easily, goes much quicker with two. If it stays waterproof in the rain I'll add another star. Our first use of this tent was on a family excursion that lasted for over a week. During the day it was hot, the nights were cold, there were winds throughout the trip, and there were a few storms as well. Even with all these different extremes this tent was excellent. There were some floor punctures in the last Eureka tent that we had (but it lasted 10 years) and it was eventually not big enough for our family. This new tent has had no issue keeping all water out while it is raining and I recommend putting a tarp underneath of the tent when setting up to make sure that you can protect the bottom from anything too sharp. Also, if you camp a lot and have set up many tents then the directions shouldn't give you any issue, but if you are unsure I would recommend doing it at least once before the first trip. This tent has definitely given us our money's worth. I have been camping in Eureka tents for a long time (borrowing my family's, now buying my own), and I have to say that I have never been disappointed. Quite the opposite, they are my favorite brand! They pack up and set up with no hassle, and I have never had any trouble cleaning any of them. They have kept me dry and cool, so I will definitely continue buying Eureka and recommend that you do as well! We have not slept in the tent yet. I have some concerns, though, and am thinking about sending it back. One, the material seems flimsy for what I paid for it. (made in China) Two, it is very tall, which is good because so am I , however, it looks like it may not be stable in the wind. As soon as the weather warms up- we will take it to a nearby campground (Zions Natl. Park) and try it out. So far this tent has met my expectations from previous Eureka brand tents. I do like how spacious it is for a six person tent, and the fly keeps everything nice and dry. I tend to carry my camping stuff in the back of a pickup truck, so I do think that the bag (made from tent nylon) will probably tear from being roughed up too much. When I first put the tent together it was pretty windy (winds around 20 mph), but even without any help I managed to get it up in less than half an hour. I left it out for a while after putting it together and the winds picked up to around 30 mph for the next day. Even with all the wind the tent stayed strong and feels great. I would put it together at least once before you actually go camping with it since the directions are a little unclear.